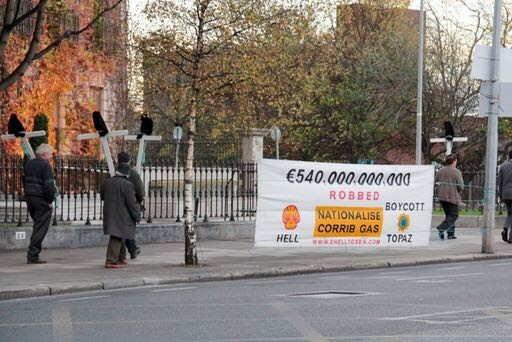 At the Doorstep of Royal Dutch Shell Headquarters in Dublin. 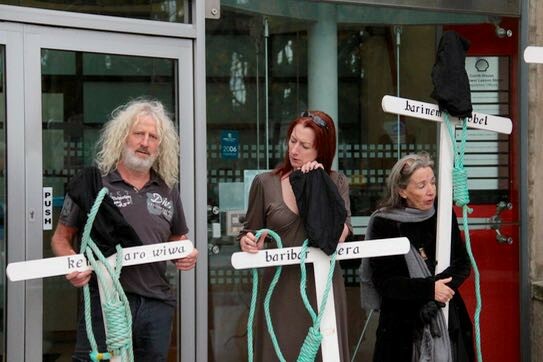 Among those bearing witness were Shell to Sea Activists Maura Harrington, Naoise O’Mongain and Terence Conway. Participating also were Independent TD’s Clare Daly & Mick Wallace. This action in front of Shell was done to show explicit parallels of behavior by Shell in Nigeria and their actions to invade occupy and take over Erris, the western most portion of Mayo. Over the last 15 years Shell schemed and bribed, bullied, and coerced Ireland not only into giving up Sovereign right to the oil offshore but to bring it ashore recklessly right through the middle of the communities of Erris and the environmentally significant Broadhaven Bay. The world’s fossil fuel industry is ruthless and unrelenting in their actions. They are also very adept at obscuring responsibility behind a veil of supposedly independent subsidiaries, partnerships, shared ventures, & subcontractors that shape-shift and change their names and logos to cover their tracks or pretend to be independent & objective evaluators so that history and responsibility is twisted and obscured while they get the profit and hide from social responsibility. Shell says that the gas will flow soon in Mayo… Elsewhere in the world, Shell and the entire fossil fuel industry is in retreat as civil society begins to force corporations and governments to take responsibility for global warming and humanity’s addiction to fossil fuel. Many believe that here at the start of the Anthropocene age, small countries like Ireland should assume Sovereign Responsibility for their off-shore and underground fossil fuel resources and keep them underground… As it is now, Shell will not pay taxes nor royalty to the Irish people for years to come… if ever! So the Irish people have nothing to lose but their supposed debt to Shell’s immoral and irresponsible continued fossil fuel exploration and extraction. Punishable by a term in Prison. Praise & honor to unceasing efforts of Maura Harrington, Naoise O’Mongain, Terence Conway and all the Shell to Sea Activists and their allies for bearing witness to this truth and carrying the burden seemingly forever against the latest foreign invasion of Hibernia! It is still not too late to cast out these new invaders!